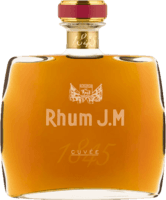 Have you found an online vendor selling Rhum JM Single Barrel Reserve Speciale? 47% ABV. Laid down 5/1/5015 and bottled 7/12/2018, so 3 year old. Aged in (new?) American oak. Bottled for Nasa Liquor in Houston, TX. Bottle 301/368. Nose: Goji berries! Loads of em. Very fruity, but with oak. Nasa Liquor tweeted it was like caramelized pineapples with a touch of salt, which is pretty close to what I'm getting. It hew pretty close to that cherry note I'm always griping about, but magically stays just away from it. Palate: Hot at first, but mellows to "warm" over time. Fruity, oaky, dry. More pineapples. Medium finish, with a slightly bitter lime-oil note. Much more interesting than most JMs I've tasted. Looking forward to spending more time with this one!